Here are two important stories in Red Devils lore, both by Michael Corcoran from the Dallas Morning News. The first is the cleverly titled “Sympathy for the Devils” (Sept. 17 1992), with a strong Lester Butler interview. It gets deeper into the band’s history — and Butler’s drug use — than most by-the-numbers articles of the time. On Mondays in Los Angeles, the blues not only live, they own the place. For the past four years, Monday has meant the Red Devils at King King, one of those off-Hollywood dives that seem to gleam with cool leather and demonic flea-market jewelry. You almost can see Gus Van Zandt in there with his hands in front of his face in the shapes of facing L’s. “Fabulous,” he’d say, just as Mickey Rourke and Jason Priestly pull up in their Harleys. But when you enter the packed King King with the Red Devils onstage, you forgive the joint all its affected poses, because the truth in the air cuts through all the phoniness. It’s called the blues. The Red Devils, who come to Dallas to play Trees Thursday night, sound as real as a screen door creaking open and snapping shut. That they’re from L.A., where, Bob Geldof once said, a thing is real only when it’s entirely fake, is something of a modern miracle. Let’s face it, the blues have been little more than a musical tourist trap lately. Acts far past their prime, such as Junior Wells, Albert King and Otis Rush, have made a living giving clumsy white people something to dance to after watching “M*A*S*H” reruns, but where are the new acts, the new songs, the new nicknames? Guys like Albert Collins and Robert Cray can really rip, but where’s the gritty soul in all those notes and horn charts? It may sound ludicrous, but five young white guys who are friends with Bruce Willis have recorded the best blues album since Muddy Waters’ late-’70s records on Columbia. The Red Devils’ “King King,” produced live by master street preservationist Rick Rubin, is as expressive as a moan, as forceful as a lovestruck alibi. On the first track, “Automatic,” harp player Lester Butler sounds like a terrified voice coming in through an air vent — savage and detached at the same time. Mr. Butler gets that cool, distorted sound by singing through his harp mike, which is fed into two 1959 Fender Bassman amps. Later, the band tears through Howlin’ Wolf’s “Mr. Highway Man” as if Sid Vicious and Johnny Rotten hadn’t disintegrated, but instead locked themselves in some crummy basement until they learned the blues. How did they get that sound? The band features such great players as former Denton resident Paul “The Kid” Size on guitar, ex-Blaster Bill Bateman on drums and the Bartel brothers, David Lee and Jonny Ray, on rhythm and bass guitar, respectively, but Lester Butler is the king bee with his amazing harmonica fits and authoritative blues shouts. He elevates the Devils from a real good bar band to the current blues heavyweight title. “I had a harmonica as a toy when I was a little kid,” Mr. Butler says. “I had ‘Mary Had a Little Lamb’ down tight, you know, but then one night when I was about 7 or 8, I heard the blues on the radio. If you play the harmonica and you hear Little Walter or Sonny Boy for the first time, well it’s something of a revelation.” Mr. Butler, now 32, ran for his harmonica that night, and he’s been playing the blues ever since. Mr. Butler moved from his home in the Washington, D.C., area to Los Angeles as a teen-ager and immediately fell in with bands clinging to the last fringes of hippiedom. He began experimenting with drugs, which were readily available to musicians. “Remember in the ’70s when they said that cocaine wasn’t addictive? I was a good argument against that bull …,” Mr. Butler says. To feed his cocaine habit, Mr. Butler was soon on a first-name basis with his neighborhood pawnbroker. He sold everything he owned and some things he didn’t. He sold his amp, his mike and, in the end, all his harmonicas. Finally, at the unflinching insistence of his girlfriend, Mr. Butler got help and “besides a couple of relapses” has been drug-free for almost five years. After a week of furious practice, Mr. Butler went to the King King on a Monday night to jam. He had earned a reputation as a great player doomed to throw it all away. He was out of control — that was the word, but it didn’t matter when he hit the stage and blew away all the other harp players waiting their turn. During the next two and a half years, the Red Devils’ membership revolved and evolved into a permanent lineup. The last player added was Mr. Size, who was only 19 when he replaced Dave Alvin in early ’91. With the lineup set and “The Kid” proving to be a great addition, the Red Devils started getting offers from independent labels (“We turned ’em all down,” Mr. Butler says. “All they could do is put out a record; they couldn’t make us any money”) and started attracting a better class of jammer. Mr. Butler taped the night that the Rolling Stones singer sat in and sent a copy to Rick Rubin, who had been tapped to produce Mr. Jagger’s next solo LP. It sounded so good that Mr. Rubin brought the Devils into the studio to back Mr. Jagger. “It was one big marathon session. We cut twelve tunes in fourteen hours, and Rick just let us play, which is his thing,” Mr. Butler says. The Jagger LP won’t be out until early ’93, but the Red Devils have their own album to worry about. They’ve rarely played outside L.A. but have just begun a lengthy tour that will take them all over the United States, including Dallas Thursday night. At every stop you can expect several local blues musicians to check out these new press darlings. (They’ll be the ones standing in the back and acting uninterested when the Devils are onstage). “I feel like we’re always having to prove ourselves as the real thing,” Mr. Butler says. “But that’s good. It keeps it intense. Come by and hear us, and tell me if we’re not the real deal.” Though Mr. Butler affects a Delta accent on stage, pronouncing “thing” as “thang,” during the interview he sounds like a Valley boy. Asked how his hero, Little Walter, met his untimely death, Mr. Butler said that it was after a bar fight. “I guess he went up against some really buff dude,” he says. Go hear the Red Devils tonight and tell me they’re not the real thing. Dude. PERFORMANCE INFORMATION: The Red Devils play Trees at 11 p.m. Thursday. 2709 Elm St. $6. Call 748-5014. PHOTO(S): HELLACIOUS BLUES: The Red Devils, playing at Trees tonight, include (from left) David Lee Bartel, Paul Size, Lester Butler, Bill Bateman and Jonny Ray Bartel. On Thursday afternoon, Denton’s Mike Flanigin received a call from Paul “The Kid’ Size, his lifelong buddy who was in town with his Los Angeles-based blues band, the Red Devils. Mr. Flanigin, who plays guitar for Soul Box, a local rhythm and blues group, expected a little small talk and the promise of his name on the guest list, but Mr. Size called to offer him an audition to join the Devils. After a heated argument and scuffle with drummer Bill Bateman in Austin the night before, rhythm guitarist David Lee Bartel abruptly quit the band and a replacement was needed. Quick. Nearly 200 people paid $5 to watch Mr. Flanigin’s tryout at Trees mere hours after the phone call. Though he had trouble finding the right key for Slim Harpo’s “Shake Your Hips,” the leather-jacketed 21-year-old adjusted nicely, providing a strong rhythm base from which Mr. Size could leap on several long, wiry solos. Messrs. Flanigin and Size later dueled it out on Albert Collins’ “Backstroke,” the night’s most complacency-shattering tune. Unfortunately, “Backstroke” was the last song of the night — one of a handful of great numbers that were surrounded by good versions of lousy songs (Billy Ray Arnold’s “I Wish You Would”) and pedestrian takes on classics by the likes of Little Walter and Howlin’ Wolf. It was not at all a bad set; there were times of real energy and excitement. But Thursday at Trees was a long way from the usual Monday nights at LA’s King King, where the Devils have ruled for four years. The Red Devils have been telling the press that they don’t like their just-released LP “King King,” which was recorded live a year ago. Band members say they’ve gotten tighter since then. In many ways (and not just because singer-harmonica player Lester Butler wore a headband the width of a WWF championship belt or because the rhythm guitar player quit in midtour), the Red Devils are the Guns N’ Roses of the blues. (Take Slash to Supercuts and he’d come out looking a lot like Paul Size.) There are better players around, but few with the right mix of chutzpah and chops. Though they hint at greatness more than they define it, both bands can blow away their peers on a great night. Thursday was a good night for the Red Devils, but it was great only for Mike Flanigin. He got the job, which means that the hottest new blues band around has two 21-year-old guitarists from Denton. PHOTO(S): (The Dallas Morning News: Randy Eli Grothe) THEY’RE HOT: Paul Size (from left), Lester Butler and Bill Bateman were without a rhythm guitarist for less than 24 hours. This entry was posted on August 7, 2011 at 6:22 pm and is filed under red devils with tags dallas morning news, dave lee bartel, lester butler, mike flanagan, paul size. You can follow any responses to this entry through the RSS 2.0 feed. You can leave a response, or trackback from your own site. This Mike Flanigin (they spelled my name wrong in the article). Johnny Ray forwarded me this link, and the articles brought back a lot of great memories. 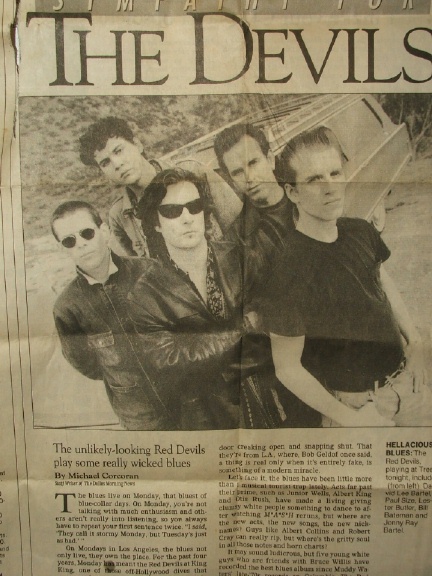 My time with the Red Devils included that whole North American tour supporting the King King record. A killing band that I was fortunate enough to be a part of for a while. Contrary to what people might think, Lester was hard drug free during the time I was with him. He worked hard and had loads of talent and charisma….as did all those guys…Johnny Ray, Paul ‘the kid’ Size and Bill Bateman. A great band. 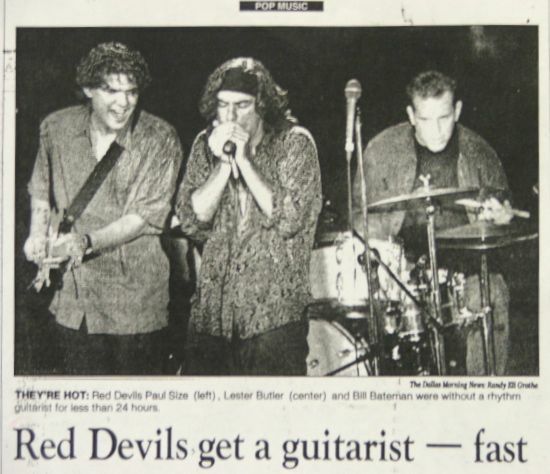 I have that original article and the headline is “Red Devils have guitarist by the sleeve.” I saved the band’s full itenerary from that tour with the date/city/club, it went from Sept 18th to Dec 11th 1992. Also have a letter from a hotel which we were banned from in Chicago where we destroyed two hotel rooms. I also remember we did the same thing in Florida. It was a wild tour for sure. So, yeah, the photo’s out in the back. And it’s still not in my hands. Great story on a great band. Damn shame to lose Lester. What might have been… I have a bunch of copies of the Jagger sessions and five copies of King King on vinyl (one red), recently released. Such great music. Top five record for sure.